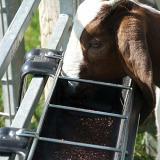 Excellent for show pens (goats and lambs) and can also be used in the creep feeding pens. 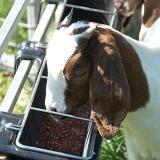 Grid spacings (ea) 5" x 6"
Keeps young kids from lying in the feeder. 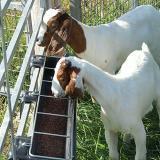 Prevents boss goats and sheep from dominating while feeding. 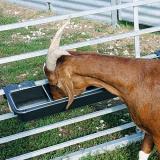 Goats can't push feed out the end with their noses. The 4" brackets are too wide for the spacings of our PowerBilt Panels (3"). They do fit our standard welded wire panels. Medicated pellet goat wormer. FDA Approved for use in all classes of goats. Does the job; had some angst attaching the steel grid as it seemed to have some 'curve' to it. Once I realized what was happening, was able to get it done right, only overall it took longer than I wanted. 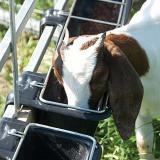 Once assembled, is just what was needed--no lambs stepping in troughs or pans, flipping them over and dirty-ing the feed that was causing waste. I am using them in a creep situation, though I can imagine it would work if one had small groups of ewes. Only drawback was seeing they were manufactured overseas, which is probably why they are 'affordable'. 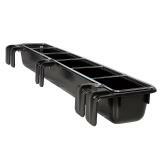 I’m using these in a creep feeder situation for my Babydoll Southdown lambs. They hang perfectly on hog panels, and can be easily lifted off to clean out and rehang. 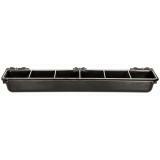 Super easy to handle, heavy enough to stay in place, and they keep the lambs out of the feed. The design keeps the larger ones from pushing aside the others. Working perfectly! Very disappointed. Ordered six of these to hang on Premier Powerbuilt panels but the spacing of the hanging bracket does not align with the spacing on the Powerbuilt panels. Wish that had been made clear in the write up since it says they work on panels. 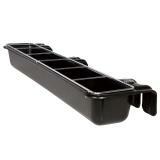 Great feeder, but very expensive. I like that the feed isn't getting pushed out onto the floor and the dividers keep the bigger lambs from pushing the little ones away from the feed.